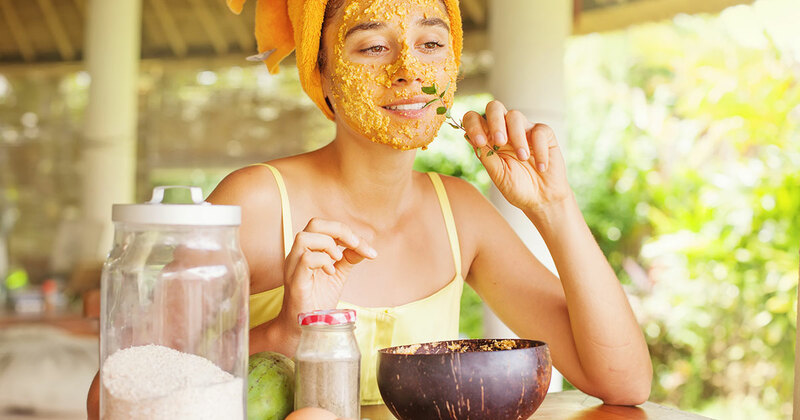 Honey kills germs and moisturizes, brown sugar exfoliates and its glycolic acid protects your face from toxins. This recipe couldn’t be simpler. Sweet. Mix honey and sugar well in a glass bowl. After washing your face, massage scrub gently in a circular motion, avoiding the eye area. Rinse well with water and pat dry. Store in an airtight glass jar at room temperature. Nutritious and luxurious coconut oil can be used on its own to remove make-up: take a small amount (about the size of a small pea) and rub between your hands to melt. Gently apply to face and eyes, allow to set for 1-2 minutes, then wipe off with a warm washcloth. For a scrub, add sea salt with coconut oil’s cleansing and moisturizing properties to draw out toxins and clean out dead cells, making for smoother skin: simply mix one part melted oil with 2 parts sea salt and blend well. You may store extra scrub in glass jars at room temperature. Use Himalayan pink sea salt for extra minerals. Cut the glycerin into cubes and melt in the top of a double boiler. Remove from heat and allow the soap to cool slightly, then add the oil, water, and dry ingredients. Stir or whisk everything together. Mix 1-3 minutes until the mixture starts to thicken. Pour into mold and let it cool and harden. Chia Seeds and Aloe: aloe is a natural skin soother and healer; chia seeds are excellent exfoliators. For this soap, substitute aloe vera juice for the oil and water and add 1-2 tablespoons of chia seeds. Cornmeal-Calendula: wonderful for sensitive skin because cornmeal gently exfoliates and calendula is a natural healing herb. Prepare calendula-infused oil (below) and add 3 tablespoons of it to the soap mixture with 1/4 cup cornmeal. The cornmeal tends to settle so make sure to whisk well. Infuse oil with calendula in airtight glass container 2-3 weeks. Make sure herbs are completely submerged. If mold begins to grow, you must start over. Strain out the calendula. Melt and combine oil and beeswax over low heat. Remove from heat and allow to cool slightly. Pour into clean glass jars and allow to cool and harden. Affix lid and store in a cool, dry place. Coffee: add 2 tablespoons unbrewed coffee grounds. Mix well, as the coffee will settle. Cinnamon-Oatmeal: add 1/4 cup of oatmeal and 1 tablespoon cinnamon to the soap base when you add the oil and water. This smells great and the oatmeal is soothing.